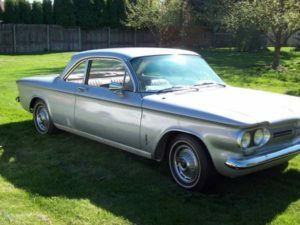 Good Old Days and a Gold Corvair - AutoNetTV Media, Inc.
By Dennis Emery, CFO, AutoNetTV Media, Inc. While driving in my car the other day, I found myself scanning through my XM radio stations looking for something worth listening to. I landed on a station that was totally dedicated to the 1960’s music. As I heard these old familiar songs my mind took me back to those “good old days” of high school. Memories of homework, dating, proms, Friday night basketball and football games and just hanging with friends flooded my mind. Another vivid memory of those days was the excitement of getting my first driver’s license. Getting that license was the gateway to a new found freedom of not having to rely on mom and dad for transportation. The process of getting the license seemed to take forever. First you had to take a driver education class. Once you passed the class you had get your parents to haul you down to the department of motor vehicles where you had to pass a written and a driving test. In order to pass the written test you could only miss no more than three questions. The pressure was on. As I took my completed test to the counter to have it reviewed by the examiner, my heart was racing. Did I study enough? Did I get more that 3 questions wrong? What will my friends say if I come home and have failed the test? Did I pass?? Then it happened…..PASS!! What a relief! However, this was no time to celebrate. There was still the driving test. But wait…. that meant the dreaded parallel parking part of the exam. Could I really do it without crashing into those orange cones strategically placed to test my parking skills? With sweat running down my face I maneuvered my dad’s car perfectly into the designated parking area and passed with flying colors. The result of all my blood, sweat and tears was the issuance of my “Learners Permit”. For the next two weeks, I could drive a car, but I needed to have a fully licensed driver (over the age of 18) in the front passenger seat. I think I drove my parents crazy for those two weeks. I was constantly nagging them to let me drive. I circled the date of my two week probation period on the calendar and two weeks to the day, we headed back to the department of motor vehicles to make it official. They snapped my picture and issued me my first driver’s license. The best day of my short 16 year life!! Now that I had my license to drive, the only thing that I needed was a car!! While my parents were good at letting me take their cars, I longed for the freedom of not being restricted to using a car only when mom and dad were not using it. In my senior year of high school, my dream was finally realized. My first car! I purchased a used, 1962 Chevrolet Corvair from my uncle for $500. It was a gold color and was a 4-speed manual transmission with the stick on the floor. Life could not be better!! Since those days, a long time ago, I have had numerous vehicles in my life. Like most of you, I can remember each car, and they all bring back great memories!! Your first new car, your first family van, the neighborhood truck, and that little spots car you have always dreamed of. Vehicles have always been and will continue to be a part of our lives. We count on them every day to get us and our families where we need to be. Just try not having access or using your car for just a few days. It is painful. Taking good care of our vehicles is more important today than ever before. Regular oil changes and following recommended scheduled maintenance will keep your vehicle in good working condition. During the next few weeks, I hope you will all take a few moments and reflect back on the vehicles in your life. Just like music, remembering the vehicles in your life will bring back those great memories of the past and might just bring a smile to your face as you remember the” good old days”.